Happy DIY Sunday! Today, I decided to make a more challenging foraging exercise for my cockatiels, Sokka and Boo, made out of some simple materials, and put together in under 5 minutes. This past week or so, I’ve noticed that my cockatiels have been getting bored with their foraging activities. They simply weren’t challenged enough by the foraging toys I made for them, which they could thrash in ten minutes. So I decided to give them their toughest foraging challenge yet: a small cardboard box stuffed with millet, toys, and other goodies. I got the idea just the other day when I realized that the cardboard lining a pack of lightbulbs could be put together into a small box. The cardboard material makes this foraging box a little tougher than other foraging activities, so some birds may not take to it right away. Stuffing such as foot toys, shredded paper, large buttons, uncooked pasta, etc. Making a foraging box is very simple. Once you have the box ready, stuff it with all of the items you have laying out, making sure to include plenty of millet. Cut out some small holes to encourage your ‘tiels to investigate, and then place in the cage. I decided to encourage my birds even more, and placed some toys and millet around the box as well. I hope this foraging toy gives Sokka and Boo a bigger challenge to work on throught the next day or so and provide them with some good mental and physical exercise. With any luck, they won’t be too daunted by the tougher cardboard box and will have it shredded to pieces by Tuesday. 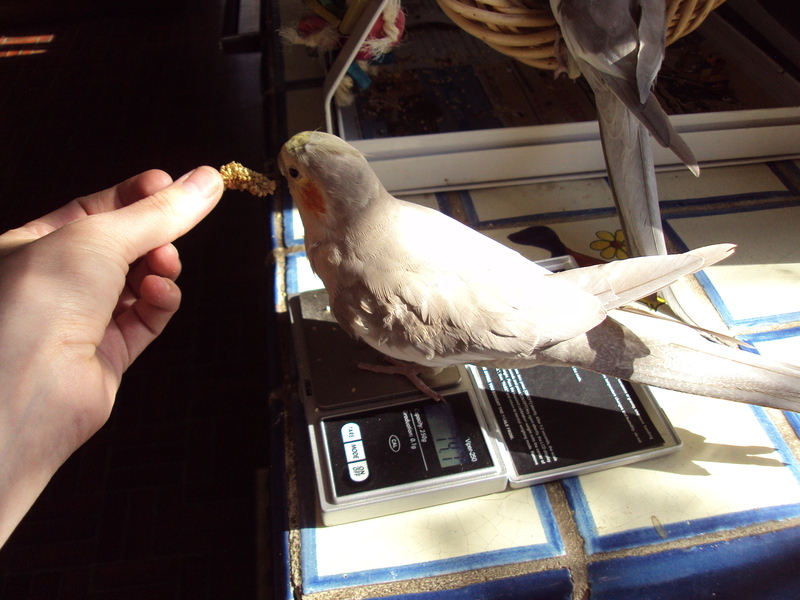 Boo is lured onto a gram scale by a millet treat. Since our ‘tiels are prey animals, they do everything they can to act healthy when they are, in fact, very ill. A sick-looking cockatiel stands out from the flock to a predator, putting them, and their flock, in danger. Even though our own cockatiels are not living in the wild, this self-preservation instinct is fully-functional, and just so happens to fool us humans all the time. So how do we monitor our ‘tiel’s health? One very effective way, along with careful observation of their behavior and droppings, is to monitor weight. Sudden weight loss is one of the most common signs of illness in a bird. Unfortunately, it is difficult for us to tell if a bird is loosing weight just by looking at them, thanks to all those fluffy feathers. So we have to depend on a scale. Cockatiels need to be weighed in grams, not ounces. You can buy a gram scale for about $20. Most birds will be very nervous about approaching, let alone standing on, a gram scale, so some trust and training will likely be involved. You can also make or buy a lightweight perch that sits on the scale to make your bird more comfortable. After a little reinforcement, however, many ‘tiels including Sokka and Boo have no problem with just standing on the flat scale surface for a few seconds. For a tame, trusting cockatiel, try to simply lure them onto the gram scale with a bit of millet or other favorite treat. I’ve found that positioning the scale on the edge of a counter or table can also help by allowing the bird to “step-up” onto it. Just remember to back off a bit if your ‘tiel gets nervous — we don’t want them to associate the scale with a scary experience. Better to stop before the bird gets too anxious and try again later. A healthy adult cockatiel can weigh from 70 – 120 grams. Birds with an inbred history, as well as certain color mutations, are much more likely to be on the small side, like Sokka and Boo are (76 and 82 grams, respectively). The bigger-boned, show birds often weigh more than 100 grams. Getting to know your ‘tiel for a while and having valuable avian vet input early on is the best way to determine what your bird’s “normal” weight range is. Weight monitoring is a very simple, but highly effective method for monitoring the health of your cockatiel. Use it a few times a month as part of a quick wellness check, and daily whenever your bird is injured, sick, stressed, breeding, or experiencing a diet change. Once you get a solid reading of what your adult ‘tiel normally weighs, you can see and respond to sudden changes much more quickly. Cockatiels just love to do everything with their human flock, and Sokka and Boo of course are no exception! They enjoy eating with us, “helping” us make dinner, and just plain hanging out and snuggling under our chins while we watch a movie. 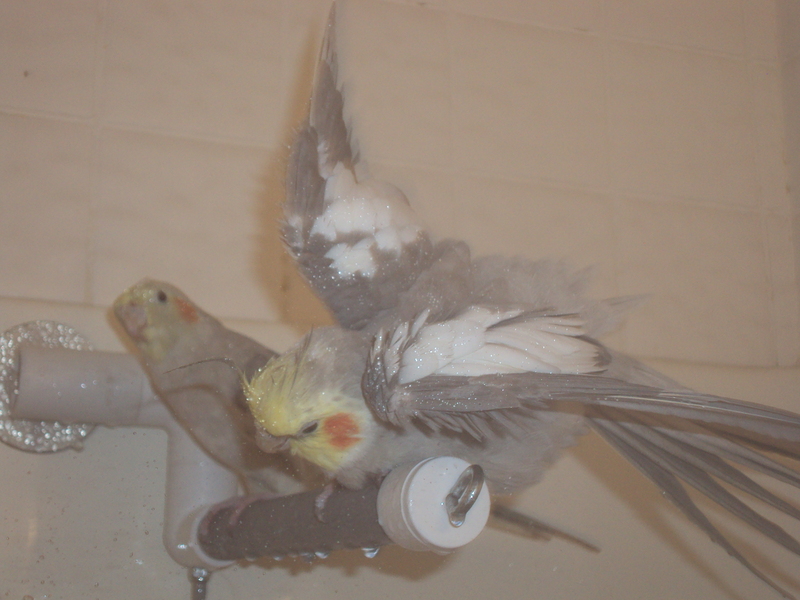 One of their favorite flock activities is showering! 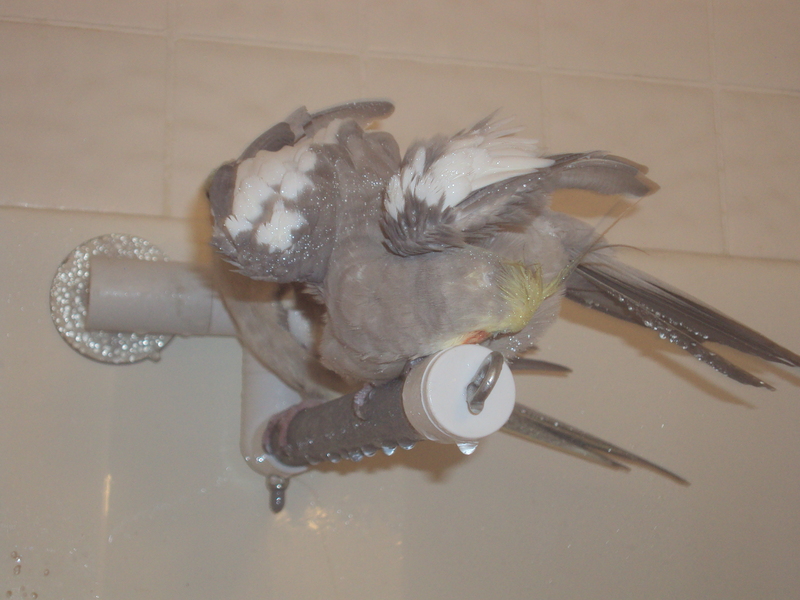 An important part of proper feather care for cockatiels is a regular bath or shower. Some birds may prefer baths in a shallow bowl of water, while others may enjoy a light mist from a spray bottle — it really doesn’t matter, just as long as they enjoy themselves and get nice clean feathers! Mine happen to really enjoy a warm shower in our bathroom, and I bought a shower perch just for this purpose! I make sure that the water isn’t too hot, and that they are out of the main spray, and the ‘tiels are free to shower, or as Boo often does, doze off in the steamy warmth. There are several health benefits to regular showers for our feathered friends. One important benefit is that it keeps feathers in top-shape. Clean, well-groomed feathers are more insulative — an important reason why regular showering should still be done in winter, as it actually helps keep our birds warmer. Another benefit is that a shower or bath is itself a form of enrichment. Cockatiels seem to have so much fun — mine even like to splash around and fling water with their beaks! Moulting birds can benefit by experienceing relief from a regular shower, as the water and steam ease the itching and wash away old keratin sheaths. And while injured or sick cockatiels shouldn’t get wet, I’ve learned that giving them a sort of sauna experience by running hot water from the shower in a closed bathroom helps make them feel better (an avian vet actually told us about this). Just make sure to do this for only 10-20 minutes, and supervise your bird the entire time, making sure that it doesn’t get too hot for them. Some ‘tiels are nervous of water at first, or may just prefer one way of bathing over another. Try offering bowls of water, misting with a spray bottle (don’t push it if your cockatiel runs away), or taking them into the shower with you. Cockatiels are vain little birds — they’ll decide to bathe when they’re ready. Remember to be patient with them, and make sure the experience is positive. Don’t ever punish your bird with water — it will only teach them to fear water, and fear you. Ideally, cockatiels should bathe or shower weekly-ish, but in hot weather, some ‘tiels like Sokka and Boo will bathe or splash around daily. Remember to take your birds into the shower or mist them in the morning or early afternoon, and make sure they can dry off someplace warm, such as by a sunny window. A cold, wet cockatiel can get sick. If your bird doesn’t already shower or bathe, try to encourage them to do so! If nothing else, it is adorable to watch them fluff their feathers and sway around. Like all parrots, wild cockatiels spend the vast majority of their day foraging for food. For up to 70% of their waking hours, these wild birds search for feeding grounds and manipulate their environment to get at tasty seeds, nuts and grasses. For our caged companions, however, eating takes all of 20min, and is as simple as walking up to a bowl. “Parrot enrichment” and “captive foraging” are concepts that address this discrepancy. By applying these concepts and enriching your cockatiel’s life through mental and physical exercise, you will not only increase your bird’s quality of life, but also reduce common behavioral problems such as screaming, biting, and even over-preening. It’s a nice and sunny October Sunday morning, and Sokka and Boo are screaming and pacing in their cage. They’re bored. Well I’m planning on sweeping up leaves on my back porch, so I roll their cage outside. This change in environment is itself a form of enrichment. The birds are experiencing the cool breeze, falling leaves, and warm sunshine. And as an added bonus, this direct sunshine also provides valuable Vitamin D! Well after about ten minutes of looking around and chirping excitedly at the sparrows flying around, Sokka and Boo find their cage to be boring again, and start pacing and calling to be let out (which of course isn’t possible without a flight harness). So I decide to compromise. I can’t let them out to play in the tree shading my backyard, but I CAN take a bit of the tree and put it in their cage to play with! The tree is a bird-safe species called Siberian Elm. I choose a leafy branch about 3ft long, and cut it down with pruners. Before I place it in the cage, I look it over carefully for spider webs, bugs, and bird droppings. I then bring the cage back inside real quick and attach the branch to a sturdy willow perch. Back out in the sunshine, Sokka and Boo commence their destruction, joyfully stripping the leaves, and hanging upside down to bite at the tiny twigs. They balance precariously on the flimsiest of branches, and pick up the shredded leaves with their feet. This little exercise that cost me nothing but a few minutes of my time has provided these little birds with a solid two hours of entertainment! As you can see, they’re having way too much fun playing to want to come out of the cage or scream. A serious warning though: branches from outdoor trees have been exposed to insects, germs, and the droppings of other birds. The only way to properly clean outdoor branches of bacteria is to wash them thoroughly with bleach and heat-treat them in the oven. Giving your birds access to leafy, un-cleaned branches can expose them to illness-causing bacteria. Understand the risks, and always carefully monitor your cockatiel’s health. Check this list of parrot-safe trees and shrubs to make sure the branch you choose isn’t toxic, and never use plants that have been exposed to pesticides. It is enrichment exercises like this one that prevent boredom and the resulting behavioral problems in our cockatiels. In my experience, cockatiel enrichment gives pet birds more confidence, reduced anxiety levels, and more energy, which in turn reduces obesity and other health problems. Applying cockatiel enrichment can be easy and cheap! It just takes some consistency, and incorporation into your day-to-day life. The results are very much worth the effort! Captive foraging is really a part of cockatiel enrichment. It is simply a way of mimicking what cockatiels do in the wild to acquire food. Food or treats that are hidden, hard to get to, or require problem-solving, provide our ‘tiels with a mental and physical challenge that also has tasty rewards! To add a little bit of captive foraging into the mix with the tree-branch activity, for example, try attaching millet to the tree branch. Hide some behind leaves for the birds to find, or suspend a sprig below on some string for the birds to reel in! Just remember that the desire to forage is instinctual, but the skills need to be learned. Don’t be surprised if your bird doesn’t notice the hidden millet right away – they learn very fast, and clearly love to forage once they get the hang of it. Foraging is also a great confidence-booster, even in young or nervous ‘tiels, as the tasty treats encourage them to overcome any apprehension and approach a new object – in this case, a tree branch. It’s fun to get creative with new foraging activities – your ‘tiels will amaze you as they figure out tough puzzles or perform some incredible feats to get at the yummy food! Several resources on parrot enrichment and captive foraging are available online, including the fantastic e-books, The Parrot Enrichment Activity Books Version 1.0 and Version 2.0 written by Kris Porter. 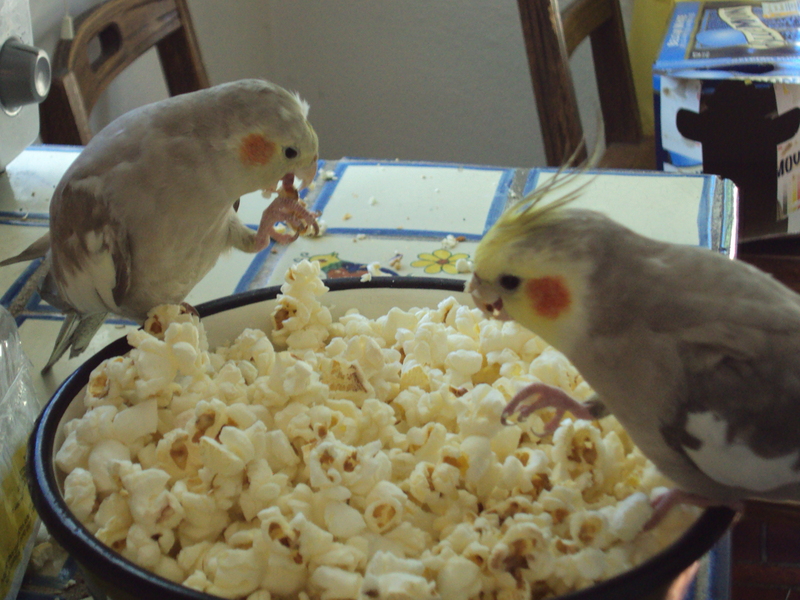 While some of the enrichment activities and toys are not suitable for most cockatiels, the ideas are endless, and provide plenty of inspiration if you’re looking for a new project. So give cockatiel enrichment and foraging a try! Your birds will enjoy it, and will find themselves enjoying a whole new and exciting dimension to their lives. I know mine have.